This case study discussion seeks to show how changes in fit position affect perineal compression. We see many clients in our fitting studio, both male and female, who present with some level of perineal discomfort. The discomfort experienced tends to be rated as moderate to high, certainly enough to take the enjoyment out of cycling. For number of cyclists however, the effect of prolonged compression of the perineum can lead to more serious health consequences. For example: erectile dysfunction, perineal nodular lesions, haematuria, abnormal PSA values, and in women, anorgasmia, labial ulceration and lymphedema, urinary difficulties, to name a few. Most clients with perineal discomfort come to us believing that the saddle is the problem and many have tried numerous without an allievation of their discomfort. In our studio, we have observed that in many cases excessive perineal pressure can be successfully relieved through proper positioning of the bike’s contact points (saddle, handlebar and pedals). The cases below demonstrate this point. 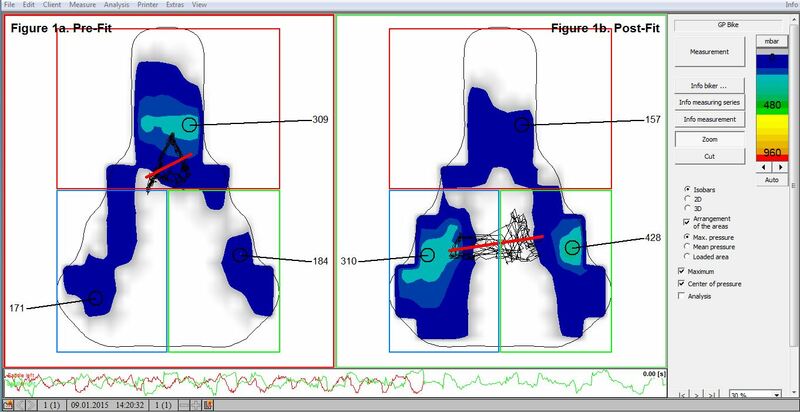 We have recorded the saddle pressure maps of cyclists, firstly with their existing position on arrival at our studio (pre-fit) and then at the end of the fitting process with their fit position optimised (post-fit). In all cases, the cyclist had complained of some level of perineal discomfort, ranging from mild to severe, and all experienced a decrease in perineal compression post fit. Our first case is of an experienced, male cyclist currently competing in the local Veterans racing series. 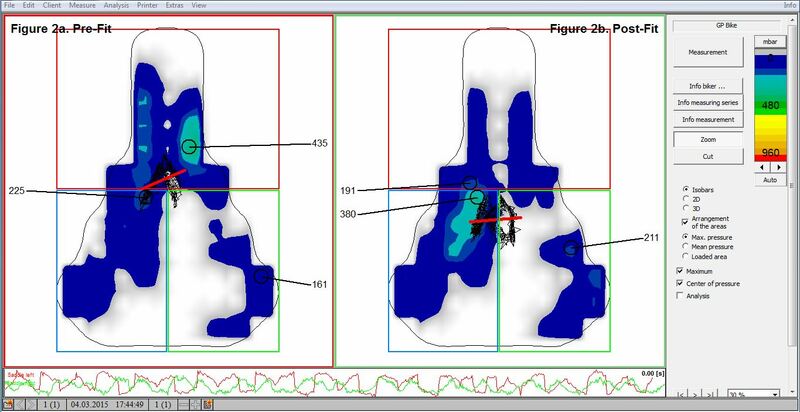 The images below show the cyclist’s saddle pressure maps pre and post-fit – figure 1a and 1b respectively. The saddle of choice in this instance is the Prologo Nago CPC. As shown, pre-fit the majority of pressure is towards the mid to front section of the saddle on the perineum and pubic bone (68% front/32% rear). A number of changes were made to the fit position including: changing the saddle tilt to a more horizontal position, moving the saddle forward and swapping out the stem for a shorter version. As shown in figure 1b the results on the distribution of pressure on the saddle have been significant. The pubic rami are now taking a significant proportion of the load and maximum pressure on the front to mid section of the saddle has decreased from 309mbar to 157mbar. 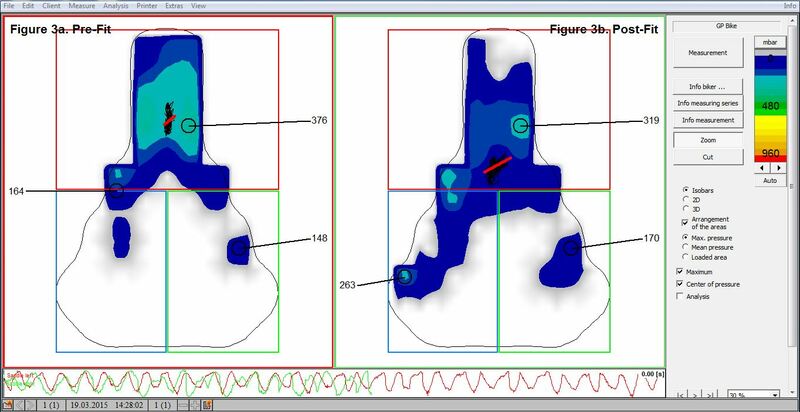 Our second case is particularly interesting because it demonstrates how a very small change in the fit position can make a significant difference in the distribution of saddle pressure. This example is of an experienced male cyclists currently in training for the upcoming 3 Peaks Challenge. The saddle of choice in this case is the Specialized Romin. Figure 2a shows the pressure distribution pre-fit, and, as in the previous case, the pressure loading is predominately on the mid to front section of the saddle. Only two minor changes were made to the fit position: the saddle height was lowered 5mm and the saddle tilt was changed from -3.5 degrees to -1.5 degrees. Figure 2b shows the results. The front to rear loading has changed from 63% front/37% rear to 42% front/58% rear with no areas of any significant pressure points in the perineal region. Our final case is another good example of where small changes to the fit position can make a significant difference to the distribution of saddle pressure. Here we have another very experienced male cyclist on an older version of the Fizik Arione. Figure 3a and 3b shows the pressure distribution pre and post-fit respectively. Only two changes were made to the fit position: the saddle was lowered 13mm and pushed forward 12mm. This may seem to be a large shift, but the original saddle height as measured from the bottom bracket to the top of the saddle was 795mm and the set back 94mm. As you can see there has been a shift in pressure off the nose of the saddle and more towards the pubic rami. In this instance the shift in pressure towards the rear of the saddle has not been as pronounced as in the other cases, however, it was sufficient to make a material impact of the rider’s comfort. The cases above demonstrate how achieving a neutral fit position can often be sufficient to relieve excessive perineal compression and increased rider comfort, without needing to change the saddle.